Visit the Product page …. With a large working volume and high heat capacity they are great for calibrating many sensors at a time or those that are larger and have tapered or an odd sheath. You get benefits of a liquid type of displacement but at high temperatures up to 1000ºC and as low as -100ºC. We recommend the FTBSL models for calibration work. The Polyscience liquid calibration baths offer a large working volume and probe lid with openings for calibrating up to 7 sensors at a time. The advanced programmable controller can be rotated 180° for easy of viewing and operation. Two models are offered, one operates from ambient +10 to 200°C while the other from -30 to 200°C. You’ll find the prices for these models to be very competitive versus others on the market. 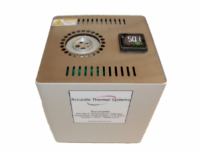 Temperature range ambient +10 to 200°C – visit the product page. 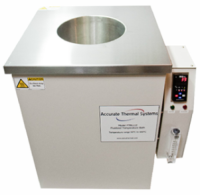 Temperature range -20 to +200°C – visit the product page. To improve the overall temperature accuracy of your process and/or operation we recommend that an independent temperature readout and probe be used. We offer a single and dual channel PRT readout as well as a rechargeable battery operated hand held unit. Combine the readout with one of several PRT probes that we offer for a high accuracy temperature measurement system. We offer several PRT sensors for connection to the readouts. These vary in accuracy, length, diameter and calibrated temperature range to meet your required application.